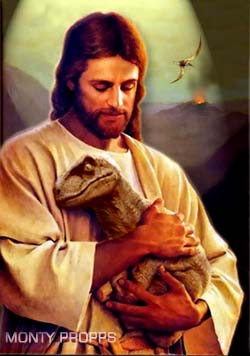 In his boundless love he can even cradle and soothe a young velociraptor. This photographic proof disproves evolution…. but if Jesus loves velociraptors so much why did he smite them with a mighty asteroid? Maybe they’re all sitting on his lap in Heaven.